Looking for shower enclosure for your bathroom? Well, consider getting a walk-in tub instead. Universal Tubs is a company known to produce the highest quality selection of tubs on the market. They make handcrafted acrylic, gel coat, and stone baths to fit the style of their clients. Each tub that they produce undergoes rigorous quality control process. This makes them confident that only high caliber products reach the customer. We’ve prepared a list of the best walk-in tub by Universal Tubs. Check out our Universal walk-in tubs reviews below. We will begin our Universal walk in tubs reviews with this 5-feet walk-in tub. This tub has an attractive white finish with the drain installed on the right side. It features a removable front access panel for an easier maintenance. It can be used as a soaking bathtub for a deep and full body experience. According to the customer’s reviews, this walk-in tub is well-designed and sturdy. Standing can be easier with the help of the handle. The door seal is excellent, but the tub needs to be cleaned thoroughly because the water will spill if there are debris. Meanwhile, there are some customers who are not happy with how it is presented in the advertisement. The description should have mentioned that there’s no seat included. The grab-handle should be efficiently placed because the tub is deeper than the standard five feet tubs. The bath is made from quality materials. It has a nice design and can be used easily. Using the tub is enjoyable. It is deeper than what was promoted. Water spills are inevitable, especially when there are a few debris. Second in line in our review for the best walk-in tubs by Universal Tubs is this five feet whirlpool bathtub. It features 13 adjustable water jets and a Chromatherapy to promote good health and wellness. It also has a friction heater for maintaining the warmth of water with no extra power needed. People who purchased this tub are happy with the product. It is excellent for relaxation and pleasure. The changing LED lights give a true spa experience. The faucet and hand shower head comes with the tub, but an overhead shower can also be installed to make it a standing shower. However, one customer expresses a minor concern about the impact of the push of water into the drain pump. Some house might not have the large plumbing system; thus, additional pressure might cause more harm than good. This did not tamper with the overall experience though. Its water jets work wonderfully. The water drains quickly and is easy to clean. It can be used as a standard shower, too. It takes 15 minutes before the tub is filled. The installation can be difficult. This bathtub has a 26 bubble massage injector and water pump with 1 HP power. It also has 13 fully adjusted and water jets that are run by the same 1 HP water pump. This model highlights its aromatherapy system, which releases a calming scent fragrances. It also has Chromatherapy LED lights for an added spa experience. 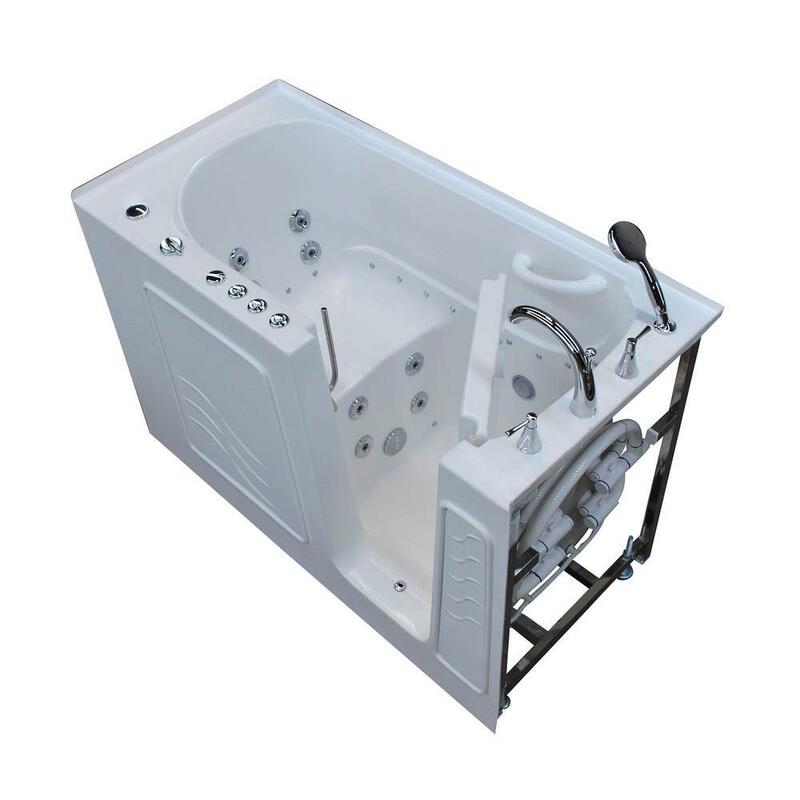 The tub comes in white finish with polished chrome trim. There’s a mix of good and bad reviews for this walk-in tub. Some said it has great value for money while others expected more for the amount they paid. Customer service is superb, but the installation team can either be a bother or helpful. Having brilliant customer service and installation teams can add better customer experience. The manuals need improvements, too. Another customer recommends that having more jets could have been better. It is water and power efficient. Its value of money equates the value of the item. The tub fills and empties fast. The tub is not recommended for heavy individuals. Its usage and installation instruction manuals need to be more detailed. 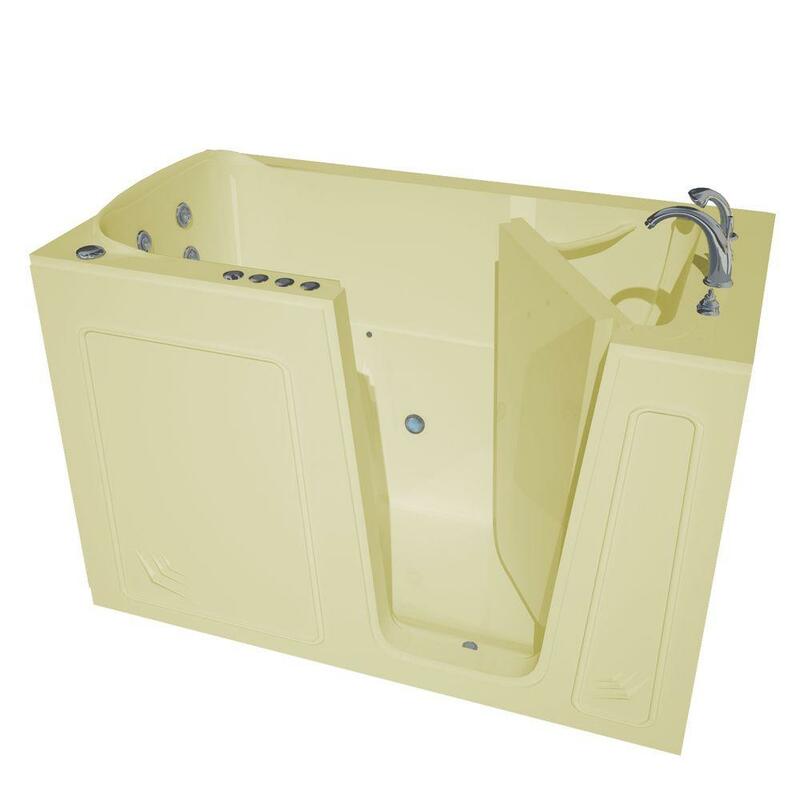 This walk-in tub is made of premium marine fiberglass that has triple gel coating. It also has a robust stainless steel frame, which features eight laser precision support points. The unit comes with 13 adjusted and directional water jets, plus 26 air bubble massage injectors. It has 1HP air blower and 1HP water pump. This tub supports both aromatherapy and Chromatherapy. The 4-piece Roman faucet set is made of polished chrome and its handheld shower can be extended. Majority of the clients who bought this product are happy with their purchase. They said its performance is admirable, and the tub is designed carefully. There is a slight problem with the drain stopper, but it can be fixed with less hassle. Thus, it does not affect the overall experience of the customers. 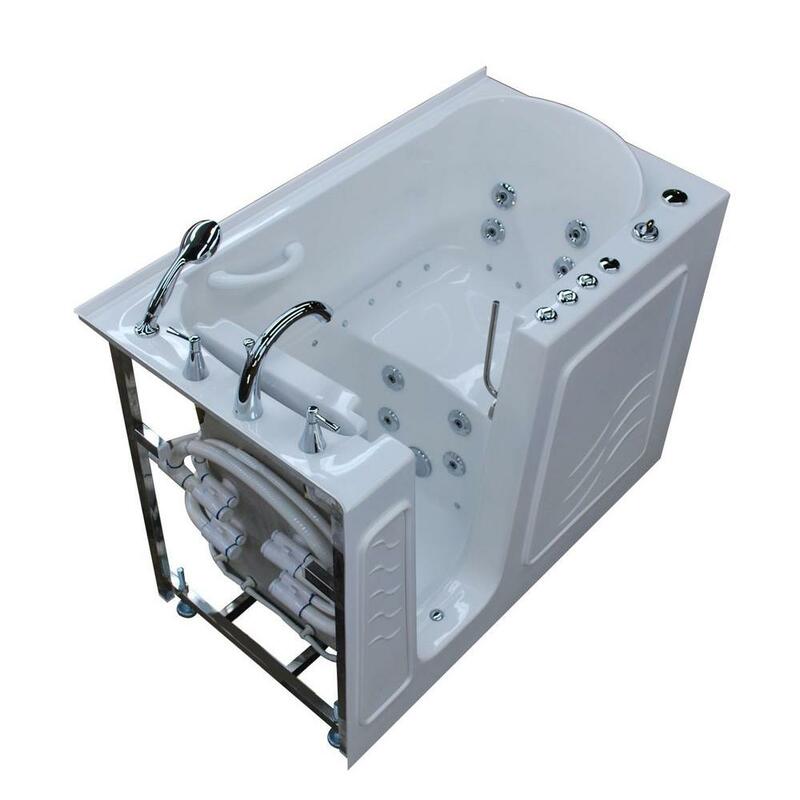 The customer service is excellent and it is recommended to test the tub according to the manual. The value of money equates the value of the item. Its quick drain is effective. The fifth tub we have on our list is a 4.5-feet walk-in whirlpool. 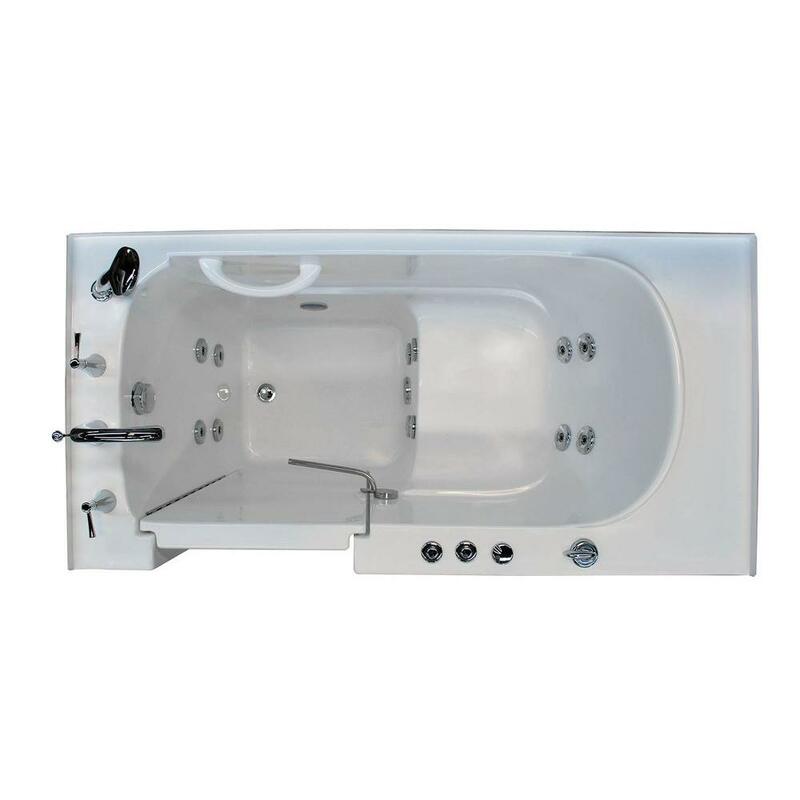 This Whirlpool air bathtub has a white finish with polished chrome trim. It has an effective water drain that empties the tub in less than 60 seconds. Those who leave their review about this tub are satisfied with this model. The price is agreeable with the features of the product. There are some recommendations e.g. having higher sides than the water. The water jets can cause splashes. Another one is that the door could have been wider. Nevertheless, these suggestions did not affect their high rating to the product. If you personally installed it, the warranty is void. This 5-feet right drain walk-in whirlpool comes in biscuit finish. It has 26 air bubble massage powered by a 1HP air blower and a 13 fully adjustable water jets motorized by a 1HP water pump. It also features both aromatherapy and Chromatherapy systems to give an added soothing spa experience. Its auto drain system, which is positioned at the right side, could empty the water in less than 60 seconds. Based on the reviews, the customers are pleased with this product. Installation is not suitable for people who are new to do-it-yourself projects, but many recommend the purchase and will order again. This product is beyond excellent. The tub is of good quality. Its controls are not labeled. 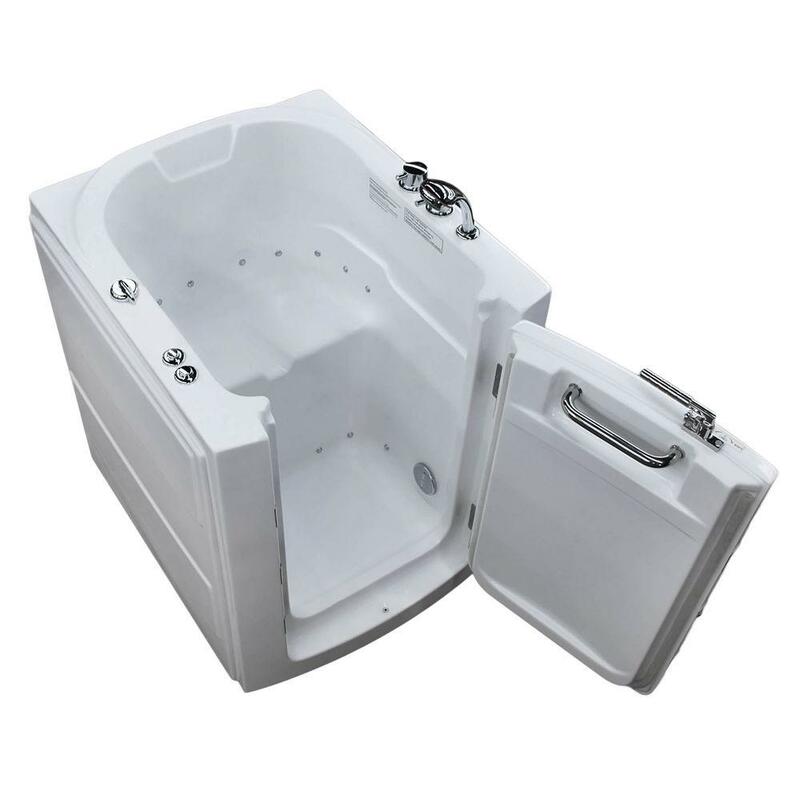 The last on our universal walk-in tubs reviews is a 3.2 feet left air bath tub. 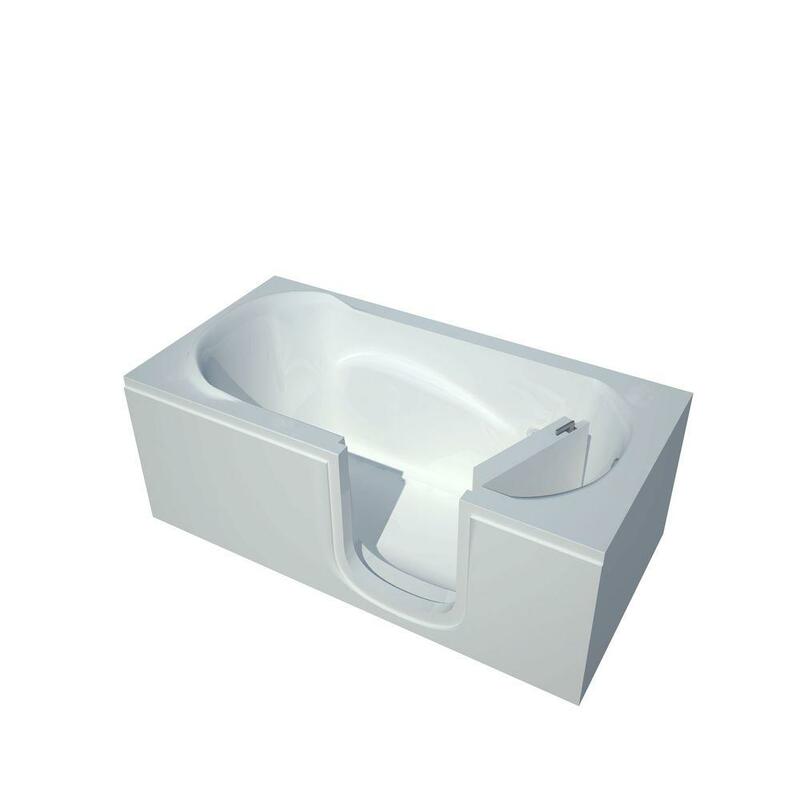 This model boasts its molded bathing seat which is ADA compliant. It has a safety grab bar and a low threshold entry. The unit has a biscuit finish with polished chrome trim. It also has a friction heater maintains water temperature. The 13 fully adjustable water jets add more satisfaction in every bathing moment with its vibrant massaging experience. The walk-in bath is safe for bathing salts and aromatic oils. There are only good words for this model from Universal Tubs. There are minor troubles with the placement of the door and the lack of tub drain mechanism upon shipment. The customers are well-compensated, and the tub drain is shipped once available. Despite the situation, the customers are still pleased with the product. The product is delivered on time, is well-packed, and in good shape. A negative review is not available. Among the seven walk-in tubs listed above, our recommended walk-in tub is the 5 ft. Right Drain Whirlpool Air Tub with Biscuit Finish. This tub has a biscuit finish, which can complement any theme of the bathroom, be it contemporary, traditional, or country. The built-in aromatherapy system is also a big plus. The bathroom fans have to be turned off to fully appreciate this feature. Walk-in tubs would have been perfect with a built-in foot spa. Overall, the spa experience that this tub offers is a great value for the money.